Whether you are rooting for Michigan or Notre Dame, or the Bears or the Lions, tailgate parties are loads of fun, and Elkhart Catering is here to make them even better. When you are a guest at a tailgate party, you get to spend the hours leading up to kick-off eating, drinking, and enjoying the anticipation, but if you are the host, you spend that time running around like a chicken with its head cut off, making last minute grocery store runs to get more chips and hamburger buns and making sure that the charcoal stays hot and the drinks stay cold. One of the beautiful things about tailgate parties is their simplicity, their neighborly spirit. They can just be a bunch of friends gathering in a parking lot, sharing hamburgers and hot dogs, playing games that require little equipment, and getting into the mood for the big game. If you want that kind of tailgate party experience, but you are too busy to prepare for a tailgate party or if squinting your eyes against the smoke while you flip burgers isn’t your idea of a good time, Elkhart Catering can provide simple tailgate party favorites for a classic tailgate party experience. We will grill the burgers and hot dogs and keep the baked beans hot, the mayonnaise cold, and the potato chips at room temperature. You can just enjoy hanging out with your friends and looking forward to the game. You will not have to get up before dawn to set up the party and have the food ready by the time people start arriving, and you will not have to worry about cleaning up afterward. Of course, the people of Michiana are famous for their creative party hosting skills, so if you have an idea for an awesome tailgate party, the likes of which your friends have never seen, Elkhart Catering can help bring it to fruition. We are a full service catering company, so we can do much more than just grill. If you want a shrimp and crawfish boil at your tailgate party, we will be there boiling seafood, potatoes, and corn on the cob. Your gluten free diet does not have to stop you from enjoying tailgate party food; we can customize the menu to your tastes and requirements and those of your guests. Perhaps you consider grilling essential to tailgate parties, but you want something a little more impressive, like grilled steak and whole cauliflower; we can do that, too. We can even bring the proper equipment for whichever party games you think will make your tailgate party memorable. We can even emcee the games if they are elaborate. Choosing Elkhart Catering to cater tailgate parties at high schools is a great idea. It will take the pressure off of busy students and parents to plan and set up a party on top of all the other things they have to do to keep up with school and extracurricular activities. 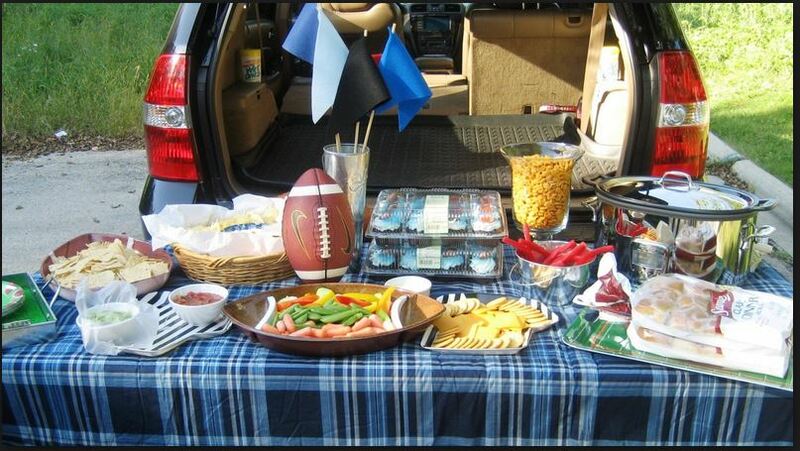 Tailgate parties catered by Elkhart Catering are convenient, affordable, and fun.